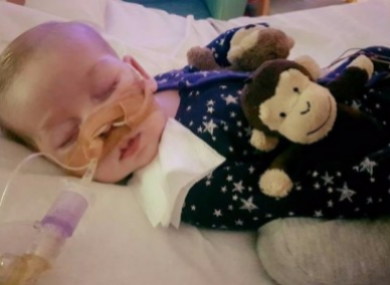 Update: Charlie Gard’s life support machine was due to be switched off but the case is now back before the UK High Court. A hearing is due to take place on 13 July for his parents to present new evidence that they say illustrates how experimental treatment could improve their son’s condition. CHARLIE GARD’S LIFE support machine will be switched off at Great Ormond Street Hospital (GOSH) in London tomorrow. The 11-month-old, who suffers from a rare genetic condition and is terminally ill, has been at the centre of a legal battle in recent months. On Tuesday, the European Court of Human Rights (ECHR) rejected an appeal by his parents Chris Gard and Connie Yates that he should undergo experimental treatment in the US. In a public Facebook post shared today, his parents said they are “utterly heartbroken” and “spending our last precious hours with our baby boy”. “We’re not allowed to choose if our son lives and we’re not allowed to choose when or where Charlie dies. The couple thanked members of the public for their support. In its ruling, the ECHR noted the “sensitive” nature of the case, but agreed with the stance taken by domestic courts in the UK. “Our priority is to provide every possible support to Charlie’s parents as we prepare for the next steps. Email “'We're spending our last precious hours with him': Baby's life support to be switched off”. Feedback on “'We're spending our last precious hours with him': Baby's life support to be switched off”.